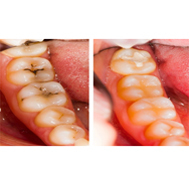 Severe tooth decay or infection (acute or chronic alveolar abscess). Despite the reduction in worldwide prevalence of dental caries, it is still the most common reason for extraction of (non-third molar) teeth with up to two thirds of extractions. Deliberate, medically unnecessary, extraction as a form of physical torture. There are two types of extractions – simple and surgical. Simple extractions are performed by loosening the tooth and removing it with forceps.Alternatively, surgical extractions are performed by making an incision into the gum and removing the tooth. Basically, the patient should feel only pressure, but no pain during the treatment. If stitches are necessary, usually the dental surgeon will use dissoluble stitches. Dentists and oral surgeons (dentists with special training to perform surgery) perform tooth extractions. Before pulling the tooth, your dentist will give you an injection of a local anesthetic to numb the area where the tooth will be removed If the tooth is impacted, the dentist will cut away gum and bone tissue that cover the tooth and then, using forceps, grasp the tooth and gently rock it back and forth to loosen it from the jaw bone and ligaments that hold it in place. Sometimes, a hard-to-pull tooth must be removed in pieces. Take anti pain medications as prescribed. The initial healing period usually takes about one to two weeks. New bone and gum tissue will grow into the gap. Over time, however, having a tooth (or teeth) missing can cause the remaining teeth to shift, affecting your bite and making it difficult to chew. For that reason, your dentist may advise replacing the missing tooth or teeth with an implant, fixed bridge, or denture. At Bright Smile, we are proud to be one of the best Dental Clinic with utmost care using the advanced technology and we have a team of best Dentists in Dubai to ensure safe and best oral health for our patients. Be it tooth extraction / tooth removal / tooth filling service you can rely on us. So if you would like to consult a dentist for your tooth removal service or tooth extraction and filling services, just call us and meet us to take care of your oral health.